On September 14th at 7:05 AM I was scarfing rhubarb-apple-crisp-oatmeal out of a bowl I carried as I hurriedly wound my way through the dukas surrounding Tenwek Hospital until I arrived at a small green and white one. The woman I was to meet there at 7:00AM hadn’t yet arrived. I relaxed, taking a moment to enjoy the last bites of my oatmeal, and trying to relax my mind with its whirling To Do! list and instead relish the still quietness of the early morning as the sun lit the colorfully painted dukas around me. Yes! 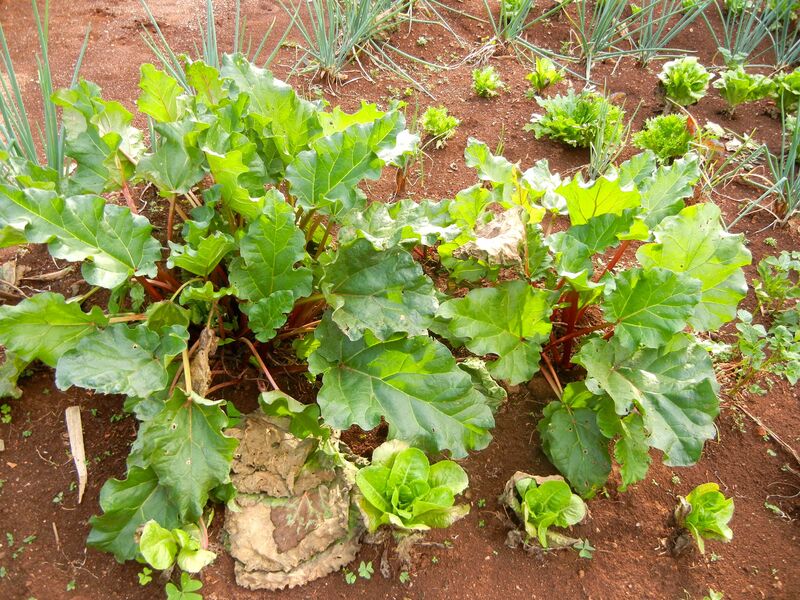 The guesthouse kitchen garden had rhubarb! This Midwestern girl was DE-lighted when she saw this on her first day at Tenwek. It was our last morning at Tenwek. 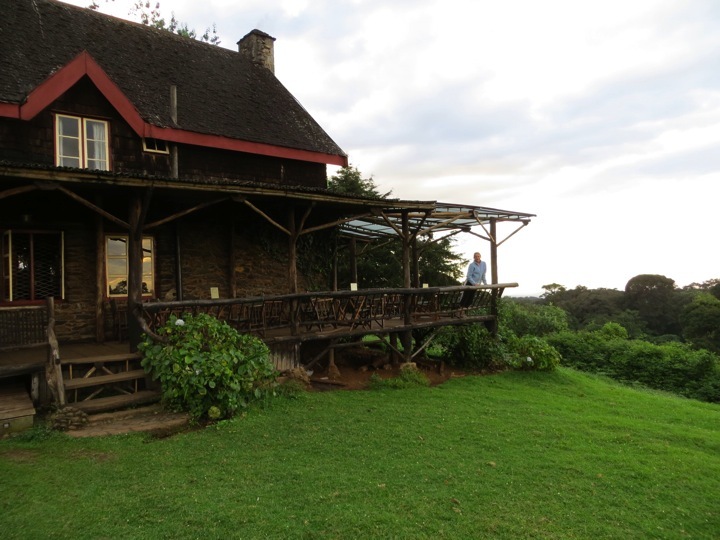 We would leave this beloved place today for another one of our “Kenyan Adventures,” but this time we wouldn’t be coming back. The adventure in front of us was the biggest yet. 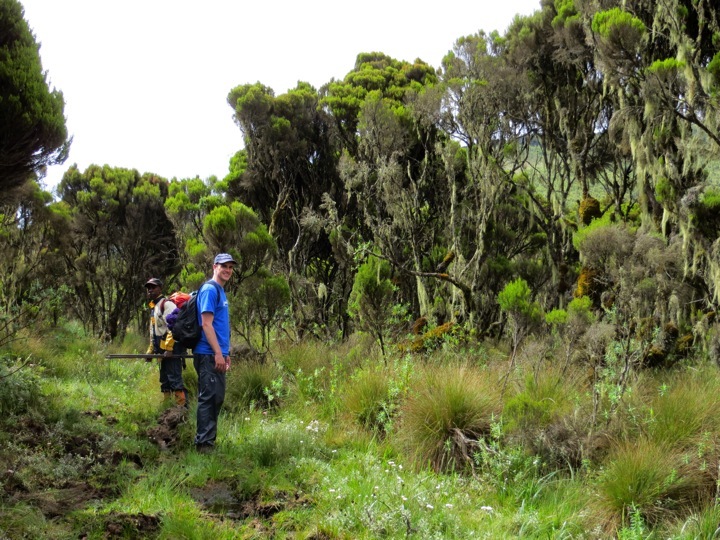 We planned to climb Mount Kenya, the second tallest mountain in Africa. This was the reason I was outside of this small duka at seven past seven in the morning. I had an appointment to get my hair braided with “lines” across the top and braids down the back. I figured perhaps, with my hair braided, I wouldn’t feel quite as gross as I would otherwise after five days without a shower. At 8:55AM, with two-thirds of all my thick hair stretched into tiny tight braids across my skull, my anxiety became too much and I told the woman braiding my hair I was very sorry, but I had to go, we did not have time to finish. Scott had been left with empty suitcases and piles of stuff on the floor to pack and our driver was due to arrive at 9:00AM. As I ran back through the dukas with my empty cereal bowl and my hair partly braided, I got a call from the driver saying he and his co-driver were nearly there. And so it was that we left Tenwek that Friday morning in our usual style, a rather stressful rush. We did our best scrambling and managed to get all of our stuff together and on the road with our driver friends, Antony and Isaac, reasonably on time. 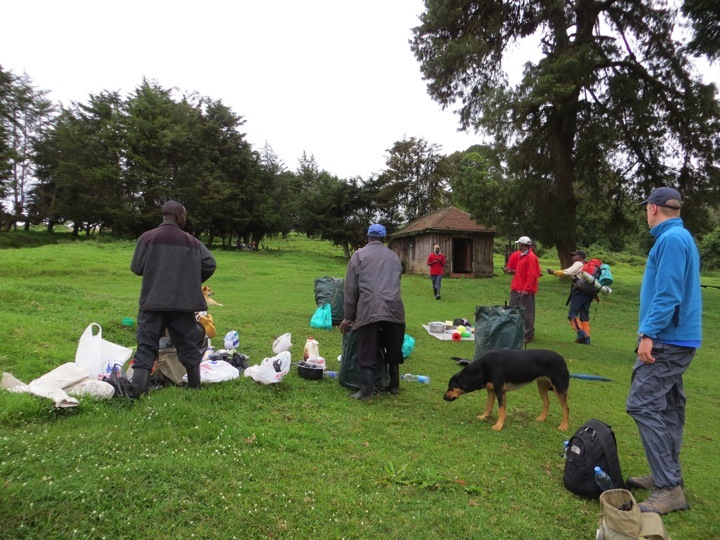 We drove through Nairobi, dropped off the majority of our luggage, and proceeded to Mount Kenya with two bulging duffel bags crammed with sleeping bags, sleeping mats, winter coats, long johns, pants, long sleeve shirts, ponchos, hats, gloves, and lots of wool socks. Arriving at Castle Forest Lodge on the south side of Mt. Kenya, we took a cup of chai at the lodge’s restaurant with our drivers before they left us and wished us the best of luck up the mountain. Castle Forest Lodge. We had chai with our drivers on this veranda and dinner that night was inside this old, historic house. 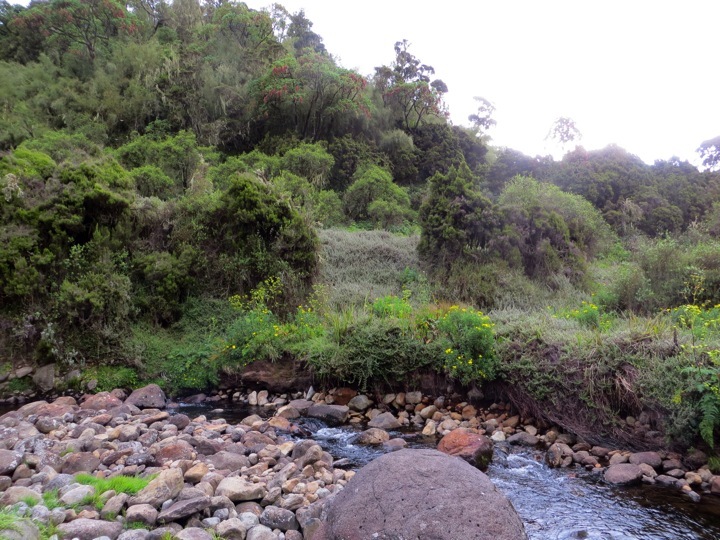 As it was not yet dinnertime, Scott and I retired to our bungalow to make sure we had everything we needed to climb the mountain packed as efficiently as possible and sort out what needed to be in our light-weight day packs and what the porters could carry. At dinnertime we feasted on an intensely green, pureed spinach soup that was so good it had me wondering if this Kenyan-trained chef hadn’t added some truffle oil to it. The coconut curry chicken that followed was equally as impressive and you can bet that before we departed on our five-day hike the next morning I had in my possession a handwritten copy of the chef’s chicken curry recipe. The elusive sweetness turned out to be mango chutney. Now you know, go add it to your curries! Anyway, back on track as there is much to cover . . .
After a much-needed great night’s sleep, we woke up the next morning at 6:00AM giddy, excited, and nervous. We had breakfast at the restaurant, and met our guide, cook, and porters who would be taking us up the mountain. Our crew, trying to fit everything into their giant backpacks the morning we left. This was done with much haggling about what I assumed to be the weight of some items compared to others. 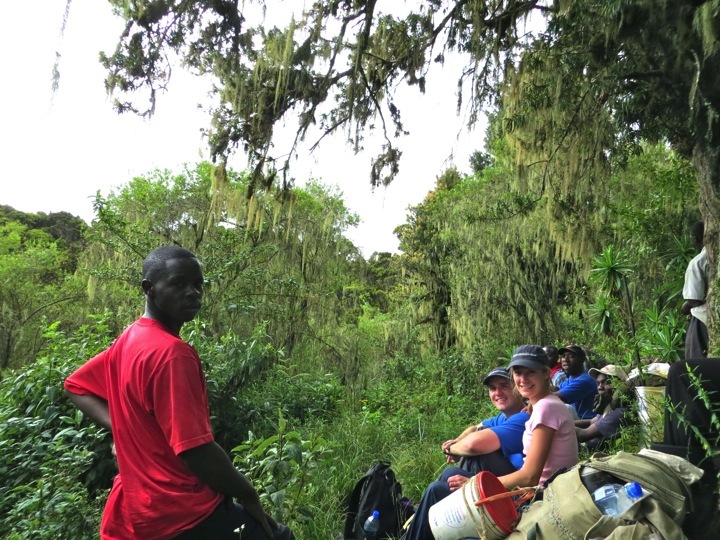 In our party there was Scott and myself, our guide Maina (My-na), our cook Moses, a porter/cooking assistant/waiter/vocal, opinionated jokester Georgie, the head porter Bruno, and four other porters who would help carry everyone’s tents, gear, water, and food. In total, we made a group of ten. 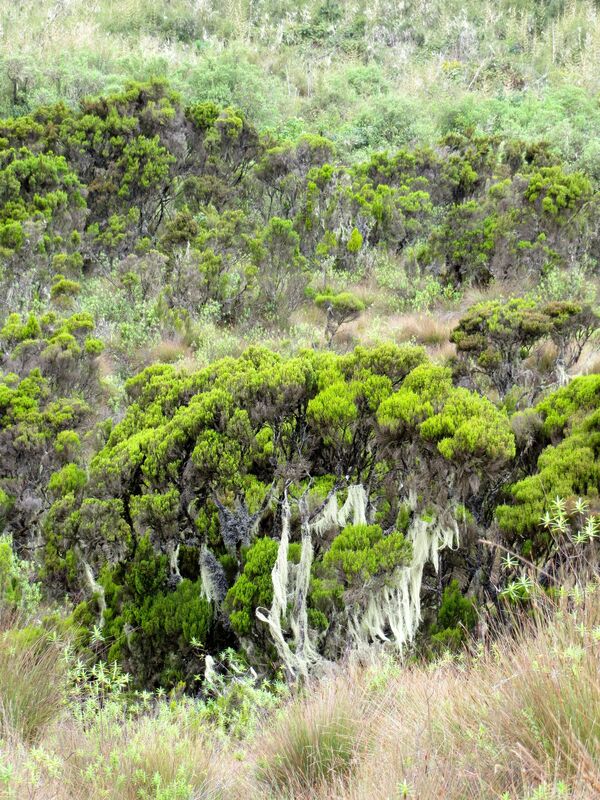 These Kikuyu men had grown up on the south side of the mountain and were some of the only people in the world who could show us the way to the top of Mt. Kenya using the Kamweti route. 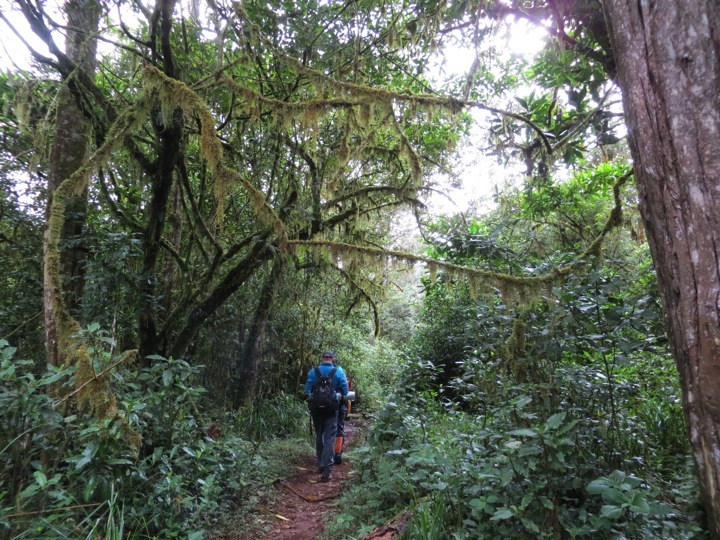 The Kamweti route is a string of elephant trails and it is rarely used; in fact, the last time someone had used it was in February. 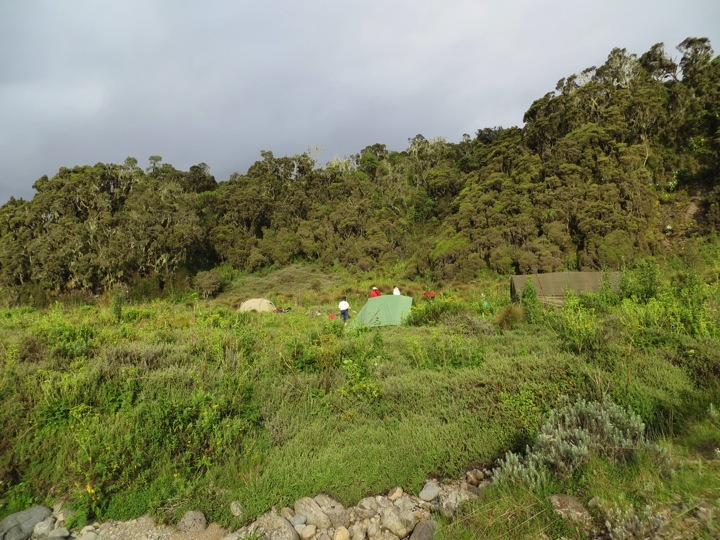 Due to this, we were guaranteed to see no one else outside our group until the third night at our base camp before the summit hike where we would join with the popular Noru Moru route. We started the day’s 17 kilometer trek by walking through 8Km of forest on an old logging road before reaching a morning break stop for chai. 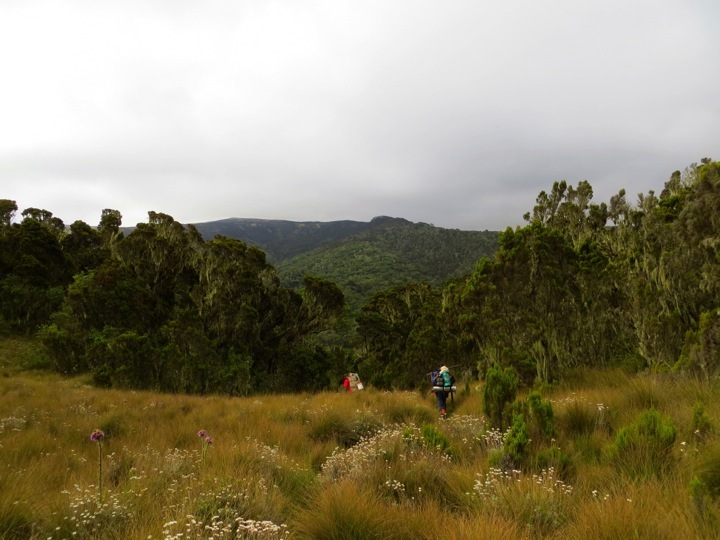 The only time on the Kamweti route that we would follow a visible trail. We knew that a year and a half ago a charging elephant had killed a woman hiking around the Castle Forest Lodge area, so our heads were constantly on a swivel. 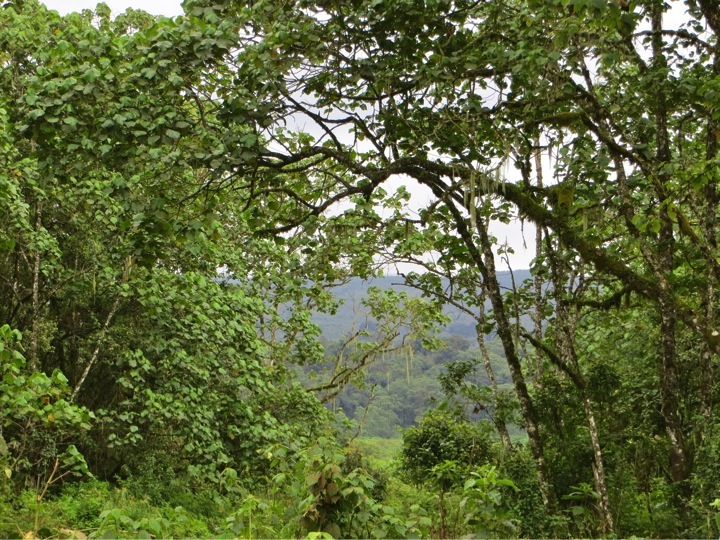 Our eyes searched behind trees, through bushes, and up and down hills looking for the looming elephant. God heard many prayers and appropriate scriptures claimed to help calm our nerves and put our trust in Him who puts breath and life into everything and can calm stormy seas—aka stop an animal from charging us in the name of Jesus! 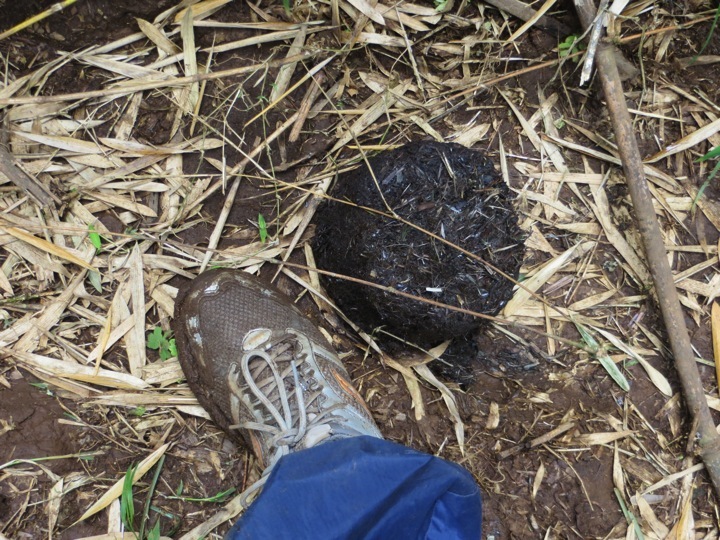 One of the many elephant turds we crossed over. As you can see, they are very uniform with a cylindrical shape. This one looks like it’s a day or two old. Where we breaked for chai was the old village grounds of our guide, Maina. He had lived here as a child but the villagers were asked to leave by the government since they were inside the Mt. 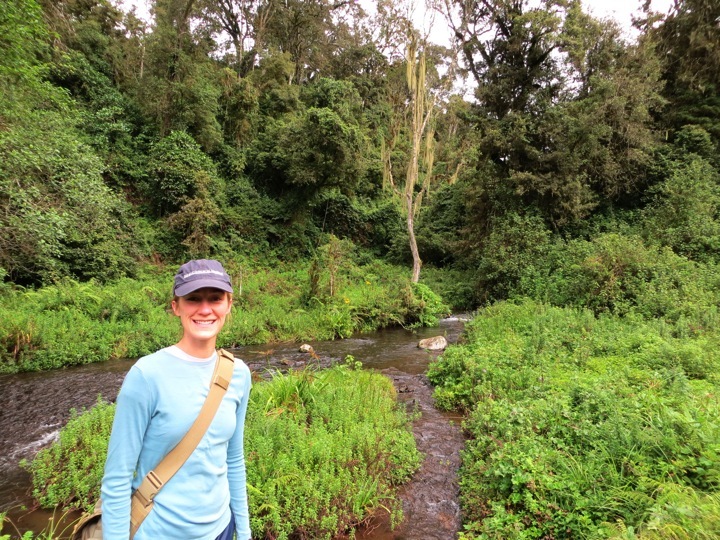 Kenya park lines and the government felt their living there might damage the natural habitat. Sad. About the bags, they are my attempt to keep my feet dry! My porous running shoes would let water in, but my hope was the plastic bags would keep my socks dry. By Day 3 I had two layers of socks and two layers of plastic bags, worked wonderfully on that day! After our chai break, we left the logging road and continued on through a bamboo forest using elephant paths and occasionally a machete to help hack our way through. 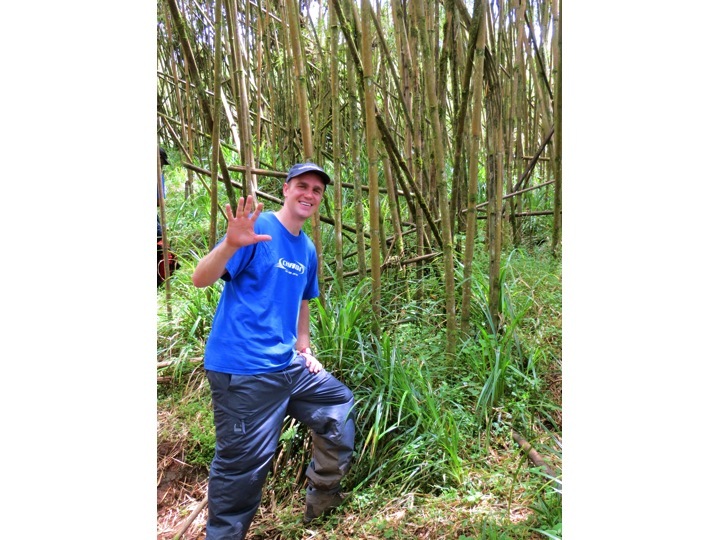 Bamboo forest, not sure why Scott is waving like that. UPDATE! Scott has told me that he’s holding up five fingers because we had walked five miles at that point. This picture illustrates well the “path” that we were on. Clearly, we would have been totally lost without our guide! Almost to our lunch spot. 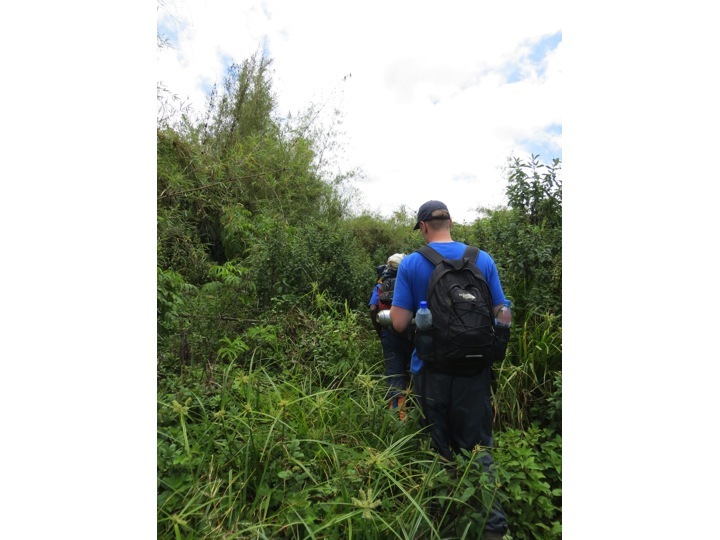 Our prayers for safety continued as we climbed higher up and over hills leaving the bamboo forest behind entering our first bit of bog where you had to be careful where you stepped lest your shoe get soaked through with water. We rested here for lunch enjoying tomato soup and tomato and cheese sandwiches. 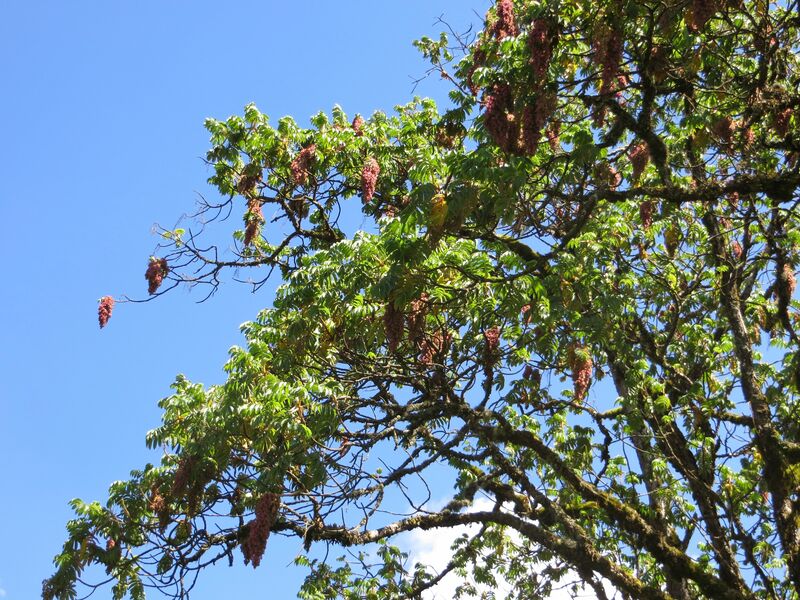 The afternoon portion of our hike took us through indigenous forest with beautiful trees covered in Spanish moss and others that had clusters of pink flowers on them resembling clusters of red grapes hanging all over the branches of the tall trees. Pink “grape cluster” flowers on the trees above us. 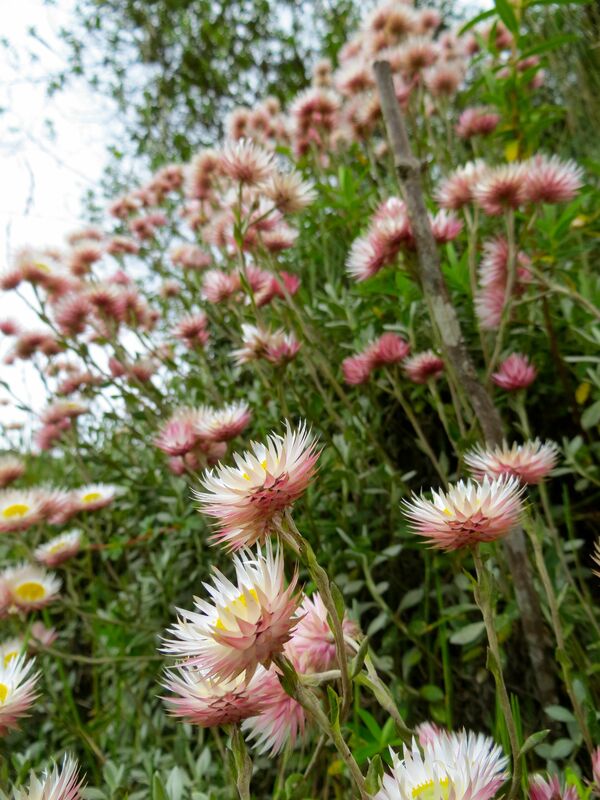 We passed through more bogs that had “meadows” of Forever Flowers and purple thistle-like flowers. 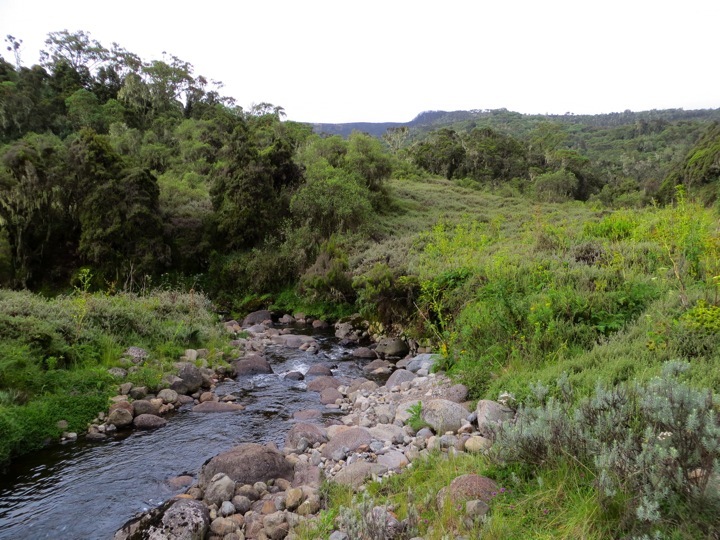 It was all new to us and very beautiful, but we hardly had time to take it in or stop for pictures because Maina, our guide, moved so quickly through the forest and the bogs. Afternoon break. Loudmouth (I mean that affectionately) Georgie is front and center. A bog filled with Forever Flowers, tall purple thistle flowers, and grass clumps. 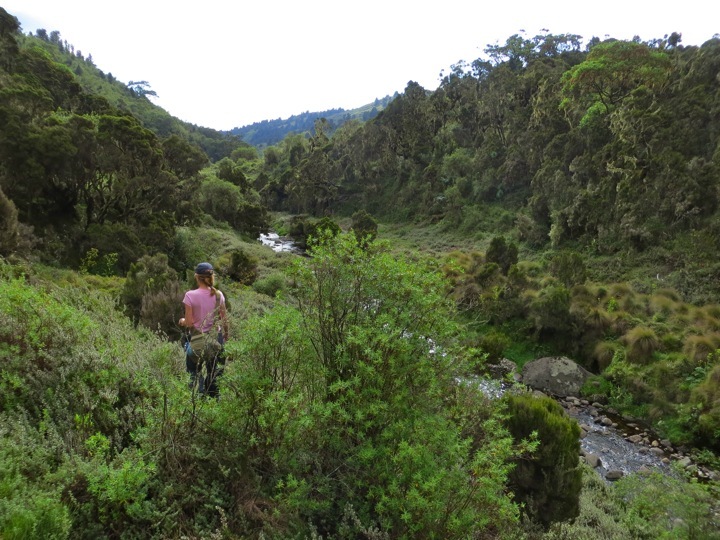 Beyond the bog is one of our porters and Maina heading down into the valley where we would camp that night. After stopping to take the picture above, I hurried to catch up with Scott and the guide who had continued on. I hopped and jumped from one clump of grass to the next and in my anxious haste I slipped off a clump of grass. As I slipped, I reached out to catch myself and my hand got all cut up by a Devil’s Horse Whip plant. 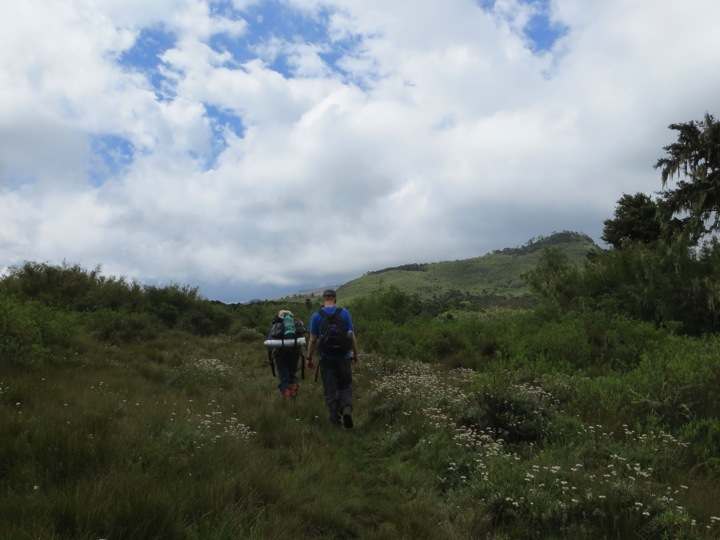 With my hand bleeding and my shoe soaked, I felt thoroughly sorry for myself as I plodded along after Scott, who’d stopped for me, and the guide, who had continued his swift pace down the hillside and was now far in front of us on the way down to our campsite. Me, holding my cut left hand up, walking after Maina down to the river we would camp by that night. Scott had taken the camera from me after my fall. Maybe he was trying to help or maybe he was worried I would ruin the camera, probably both. At the bottom of the hill, we crossed over a small river and Maina actually helped me (which helped to end my brief pity party) across the river and then it was just a couple hundred meters to our campsite in the river valley. Look what we found at our campsite! 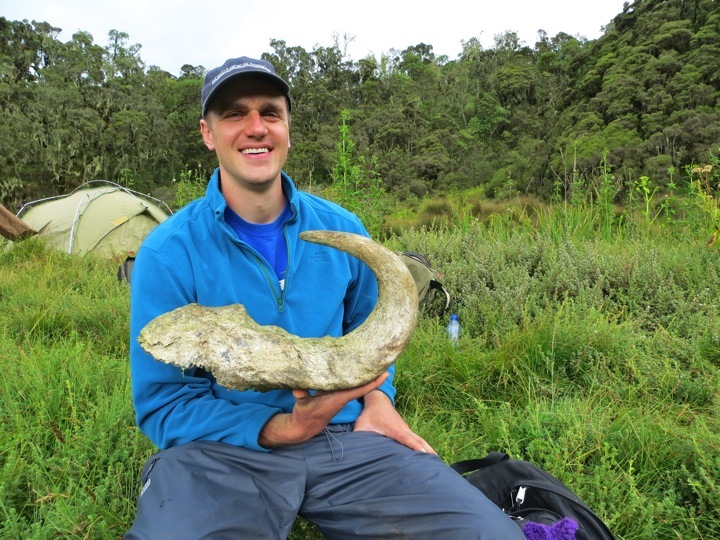 This horn belonged to an African Buffalo. Also a very dangerous animal, especially when they are alone and not in a group. Our tent is behind Scott. The view out of the front door of our tent. The view from our bathroom, a.k.a. the open area behind the back of our tent. Tehe. 😉 Up above you can see some of those pink flowering grape cluster trees. Our camp. The crew’s tent is the green one in the foreground. (Still not sure how all 7 guys fit in there. I couldn’t have done it, that’s for sure.) The kitchen tent is to the right and our tent is in the back left. That evening for dinner, Moses made the best fish and chips we have ever had, along with popcorn, a platter of fresh, tropical fruit, and chai, of course. The dark kitchen tent in the evening. 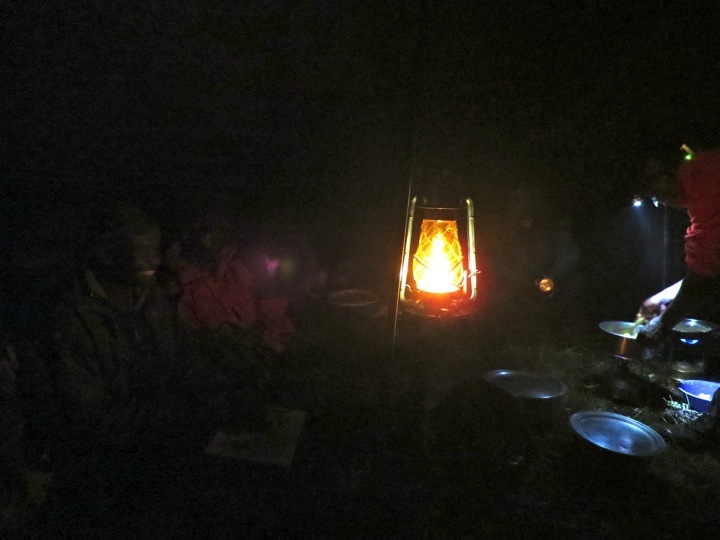 Moses is on the right working his magic preparing our dinner over two kerosene burners. 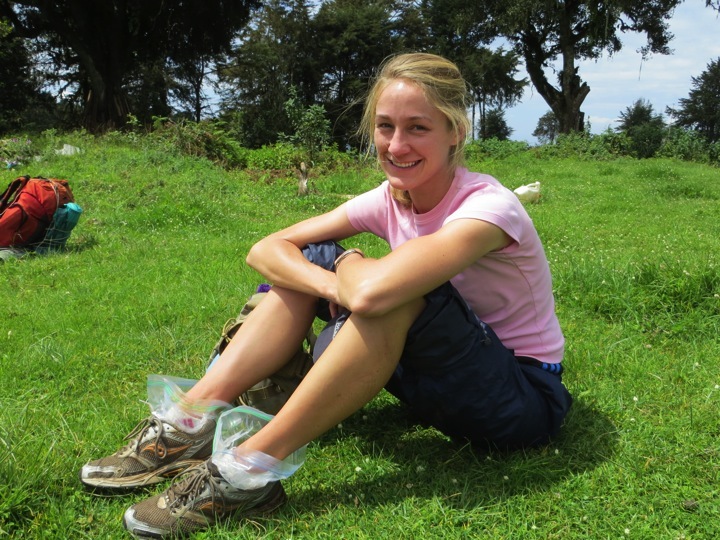 During dinner, the porters and Maina sat around a campfire and dried this poor mzungu’s wet running shoes. We retired to bed that night happy to have survived the first day and nervously excited about what the next day would hold.